Motorway aires are designed to provide a suitable environment for relaxing, refreshing and recovering during the long, hard journeys. As well as facilities of often dubious nature, picnic tables and seats, a telephone kiosk, there are often optional extras such as a play area or a display related to some local interest or event. 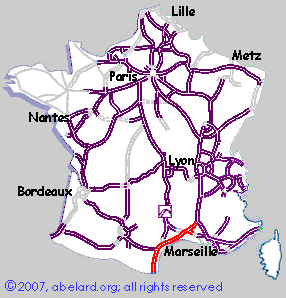 The A9 motorway (La Catalane) runs from the Spanish border just south of Perpignan, going up the Mediterranean coast until it becomes La Languedocienne, then turning a little eastwards to pass Narbonne, Montpellier and Nimes on the way to Orange. A main artery from Spain to the industrial zones of the Rhone Valley and Marseille, as well as a main tourist highway, means that the road carries a fairly continuous stream of goods vehicles, heavy and otherwise. The first themed aire to be built by the Autoroutes du Sud de la France [ASF] company, this extensive aire includes shops, a café and a hotel [web page in French], as well as vast amounts of parking. With its theme of Catalonian architecture, this aire provides either a taste of Spain to come, or a reminder of places visited, depending from which direction you access this aire. Click on the yellow link above to see the full page for the Catalan Village aire. On the way north (up) from Spain and along the Mediterranean coast, before the A61 autoroute junction, you will be spoilt for choice as to where to stop for a break, a distraction, a picnic. After the grotty little layby aires that are the Spanish contribution to motorway travelling, you will be encountering automotive wonders as you progress up the coast to Perpignan and beyond. The wondrous aires include Château de Salses, Fitou and Sigean. The aires going south are mostly not quite as interesting, though some have a tunnel connecting to the northbound aire. This deceptively big aire overlooks a large former frontier fort on the coastal plain below which can be reached from the aire after a short countryside walk. Click on the yellow link above to see the full page for the Château des Salses aire. View from the ceramic plan of the Fortresse de Salses to the fort itself. / The entrance gates to the Fortresse de Salses./ Wildflowers / Chateau de Salses fort.